Cashews are an extremely versatile nut. When blended with water, they produce a smooth and delicous cream. Seasoned with salt, lemon juice and enriched with the addition of a little olive oil, and cooked to thicken, this provides the base for a dairy-free, savoury white sauce to go over vegetables, pasta or pizza as a cheese replacement. This is how we make the basic sauce for our mushroom cashew sauce. We also use ground cashews in the base to the almond bars. Cashews are also delicous when made into a cashew-nut-butter, or lightly toasted and eaten whole with salads and vegetable dishes. Ground cashews and sunflower seeds make a delicious savoury 'nut ball' when mixed with ground tofu, sauteed onion, garlic, seasoning and breadcrumbs. Form into balls and bake until golden. Serve with pasta and sauce. 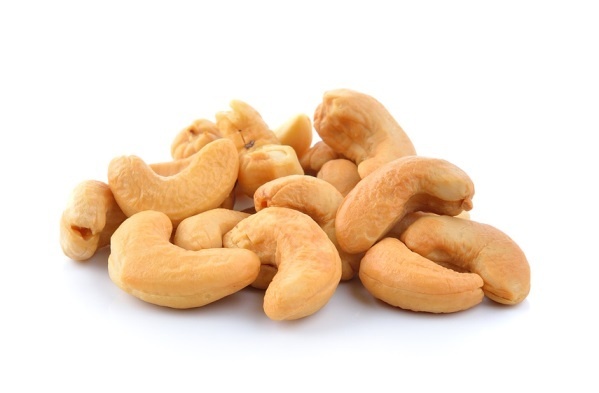 Cashews are a good source of the vitamins B1 and B6, and the minerals iron, magnesium, manganese, phospohorous and zinc. They are 30% carboydrate, 43% fat and 18% protein. The natural fats found in nuts and seeds are very good for you. It is prefereable to eat the oil as it is found in the nut than extracted oils.